It's time to check in with club play out West and the playoff implications. San Francisco Golden Gate have taken one step closer to the club regionals in Tucson with a 45-5 win over the EPA Razorbacks. The win ensures that SFGG will finish as the top team in NorCal. The division plays a round-robin playoff among the top four and with only one week left no one can catch them in the standings. Straight from the start SFGG were all over the Razorbacks. Izzy Donalson had a couple of tries while Volney Rouse chipped in 13 total points. SFGG's opponent in the next phase of the playoffs is ORSU. They beat cross-town rivals the Portland Pigs 16-10 to win the Pacific Northwest. Tyler Thompson has three penalties and a conversion to lead ORSU. SFGG will take on Olympic Club next week before facing ORSU on May 6th. Life West are the other team from NorCal with a shot at making it to Tucson. They beat Olympic Club 61-28 to seal second. The Gladiators went up 7-0 early before a try from Bubba Jones and penalty from John Gallo gave Olympic Club a 8-7 advantage. The lead continued to oscillate back and forth with Tyler Harrison scoring for Life West and Paul Deneys doing the same for Olympic Club. With ten minutes left in the half it was only a 14-13 advantage for Life West. A try from Devereaux Ferris and another from Hamilton would increase the lead for Life West and from there the Gladiators never looked back. At the half they lead 26-13. To start the second half they rattled off 21 straight points before Olympic Club was able to get back a couple of tries. However, by that point it was out of reach. Life West will next face either the Austin Blacks or Dallas Reds for a spot at regionals. Life West will first play the EPA Razorbacks to round out round robin play and they also have a friendly scheduled against the Glendale Raptors on May 13th. In the Red River the Austin Huns and Austin Blacks met in a huge cross-town rivalry with playoff implications. Both the Blacks and the Huns had a number of Eagles on their rosters for this one and in the end the Huns came away with a 31-30 victory. Chris Baumann started the scoring for the Blacks and was soon followed by Antonio Winn and Adam Armstrong to go up 17-0. Still, the Huns experience began to pay off. A try from Kyle Breytenbach got them on the board and then a yellow card to the Blacks gave the Huns a man advantage. Tries from Peter Malcolm and Brian Welborn would give the Huns their first lead of the match at 19-17. The Blacks got a penalty from Armstrong to regain the lead and a try from Tane Jericevich would put them up 25-19. With 15 minutes to go the Huns struck back with a try from Joedee Reyes before Baumann got his second. With 10 minutes to go the Blacks were up 30-24. That left enough time for Deon Minnaar to score at the death to seal the result. The Huns could still technically be caught in the standings but they play bottom side Houston Athletic next week. The Blacks play the Dallas Reds for a chance to play Life West. The Reds beat the Dallas Harlequins 60-31. 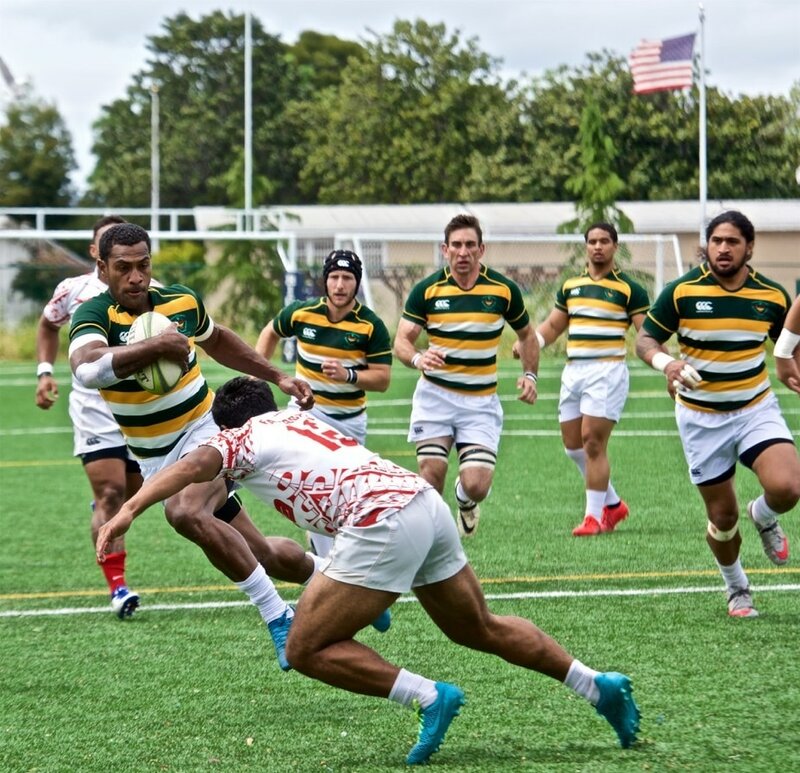 The Pacific South semi-finals took place over the weekend with one minor upset. The Santa Monica Dolphins had been a top two team all season but were beaten by rivals OMBAC 25-22. OMBAC will now face Belmont Shore for the SoCal title and spot in the national playoffs on May 6th. Belmont Shore advanced to the match with a 58-23 win over the San Diego Old Aztecs. Belmont Shore held a 24-11 lead at halftime and increased it in the second half. Whoever advances to the national title match from the West Regional is going to be a top, top side. Teams like SFGG, Life West, the Austin Huns, and Belmont Shore or OMBAC would be national championship contenders every year but add in the changing dynamics in each club, whether that's newly signed professional players or players coming off playing in PRO Rugby, and you will have four very good teams.